Eye Contact has been serving the community since early 2012. We have established ourselves as the town’s local opticians and serve families all around the area. This business is owned by Mr. Tushar Ambre & Mrs. Pallavi Ambre. 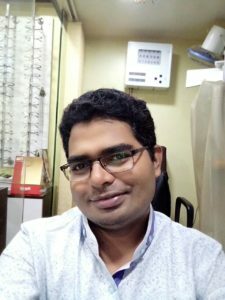 Mrs. Pallavi Ambre is an experienced and trusted Optometrist with emphasis toward serving the local community. Her zeal to guide and assist customers with most appropriate advise knows no bounds. Looking after your vision and providing you with the best healthcare to help you get the very best from your precious vision.